The track itself is the facility’s most dynamic feature, and one of only a handful of indoor tracks in the U.S. to offer a six-lane, 200-meter, hydraulically banked oval. The configuration of the track layout includes room for all six field events, with the weight throw, shot put and high jump pits located outside the track oval, and the pole vault, long jump, and triple jump runways located inside. 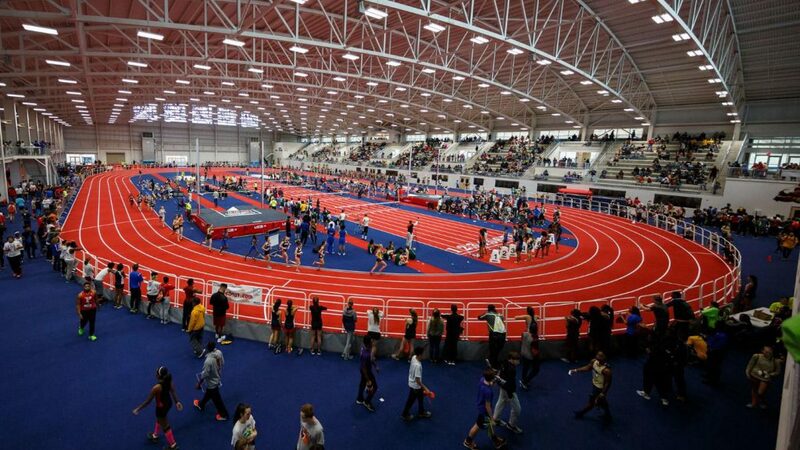 The facility is among only a few indoor tracks in the nation large enough to have a second-floor mezzanine area — a spacious loft where competitors can sit or huddle with their teammates and interact with athletes from other schools — above an eight-lane, 100-meter warm-up track straightaway. The mezzanine is on the opposite side of the track from stands that seat nearly 1,500 fans, with the capacity to hold more than 2,500 when track-level portable bleachers are added. The complex is large enough for a maximum occupancy of 5,000, including 2,500 or more athletes.